Friday night, Oct. 11 and Saturday night, Oct. 12, we huddled in the press box at Mohegan Sun at Pocono Downs, shuttling from the intimate area to the winner’s circle during two programs laden with Breeders Crown activity, the eliminations for the Oct. 19 finals. This was the first of our two weeks in the gloriously beautiful Pocono Mountains, at the five-eighths-mile oval with the fast, deeply rich-reddened surface and smooth turns, sharing with a global audience the talents of the sport’s human and equine stars and finest journalists. We return next weekend to cover the program at Pocono that hosts the dozen finals on Oct. 19. Our Thursday blog and the spin-off blog, our Breeders Crown Countdown will preview the races. As well, @FrankCotolo and @HarnessRaycer on Twitter will be presenting tips, info and photos through the card. Our thanks, of course, to the Hambletonian Society –Tom Charters, Moira Fanning and the Board of Directors—for the accommodations and the opportunity to rejoin our cohorts and the sport’s insiders to further the great wagering benefits of harness racing through TwinSpires and assist the industry with racing reports. Along with Moira Fanning, Jay Bergman, Ken Winegartner and Ray Cotolo, complete recaps of all the elims were produced and are accessible by clicking the races’ appropriate links in our wagering recap below. We are going to recap our betting activity thoroughly, including the blogs’ suggested contenders and the on-site tweets through the Twitter accounts above (as well, many tweets are retweeted through accounts such as Pocono Downs, @MSPDRacing, so check your Twitter coverage so you don’t miss one instant update or change from the source of the action. In the first of two frosh-filly trot elims , we were third with Goddess. Off at 45-1, she paid $11.20 to show, beaten by two favorites, Shake It Cerry and Lifetime Pursuit. Elim two for the filly trotters found our choice, Demanding Sam finishing third, paying $4 to show. She went off at 14-1 and was beaten by two of the three top choices. The first of two elims for frosh-filly pacers was won by a second choice, while our blog’s contender, Ali Blue, finished fourth at 6-1. The @HarnessRaycer tweet supported Southwind Silence (12-1), who finished second and paid $6.40 to place and $15.60 to show. The second division for the filly pacers featured a mild upset from Allstar Rating. We backed the top choice, Precocious Beauty, who finished second and paid $2.10 and $2.10. We backed Father Patrick, the stunning frosh-colt trotter, in the frosh-colt trot elim (a single mile where the top seven qualified for the final) and we offered a sharp second-place choice in Nuncio (15-1). Father Patrick won, paying $2.80, $2.80 and $2.10. Nuncio finished second, paying $8.20 and $8.40. The exacta came back $26.80. We must lead with another great tale of Captaintreacherous (photo above) because once again he defied all odds of winning with a trip that any other pacer would surely call treacherous. For this champion pacer, though, being hanged and dueling are not problems, even when they come in tandem. Read the story of his victory in the second soph-colt-pace elim. His victory, which we supported, was worth $2.60, $2.20 and $2.10. You could get only $2.10 across the board on our other obvious choice, Bee A Magician, in the second division for soph-filly trotters. But you cannot get the definition of a “lock” any closer than this gorgeous gal.Luck Be With You was our winner in the third division of frosh-colt pacers. He paid $6.80. $3.40 and $2.80. Though we blogged liking Bluto in the first division of soph-colt trotters, @HarnessRaycer tweeted on site about All Laid Out and he won, paying $7.80, $3.40 and $2.60. We liked Apprentice Hanover (11-1) in the first soph-colt pace but we also mentioned the winner, Lucan Hanover ($7.80, $3.60 and $2.80). “Apprentice” finished fourth. 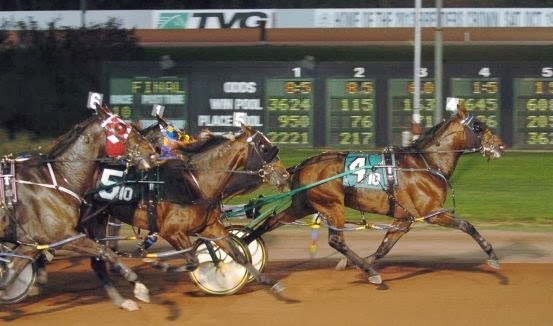 When Coffeecake Hanover won the first soph-filly-trot elim, following the on-site tweets paid off again. Our blog choice, Bouncing Bax (5-1) finished fifth to the @HarnessRaycer tweeted choice, Coffeecake Hanover, paying $23, $4.80 and $3. The third choice for @HarnessRaycer, Doo Wop Hanover, lighted up the toteboard in the second split for frosh-colt pacers. When three top choices broke early in the race and were eliminated, “Doo Wop” went on to race smoothly to a win, paying $64 to win, ahead of a 10-1 shot and a 35-1 shot. Our choice, Beat The Drum (45-1), finished sixth. The first division of three frosh-colt pacers was a loss with Let’s Drink On It (13-1), who finished sixth. We had D’orsay (2-1) in round one for mare trotters; she paid $3.80 and $3.20, beaten by the public choice. We lost with Swinging Beauty (15-1) in the single elim for mare pacers; we were fourth with Royalty For Life in round two of the soph-colt trot battle; Win Missy B (16-1) tried to take the older mare trotters wire to wire with three fiery panels but tanked in the second round for mare trotters, won by top choice Maven. In the older pace, just about everyone was shocked at the lackluster performance of A Rocknroll Dance. Foiled Again won the race with verve and muscle but the favorite, our choice, too, “Dance,” never got into the race, finishing last in the field of nine. We will report anything we hear about the condition of the fine pacer. There were no third-place finishers from the list. The entire H2W list from Thursday provided only seven horses. Upcoming lists, especially after the Breeders Crown events, guarantee more possible plays. Draws for the sophomore colt pace and the sophomore colt trot will be pulled at a special press conference at Pocono on Wednesday, Oct. 16. Wagering on the 2013 Breeders Crown finals at Pocono Downs on Oct. 19 will include the following exotics in conjunction with the U.S. Trotting Association. There will be three Pick-4 wagers, starting with the first Breeders Crown race on the card, which will be Race 3. The three Pick-4 wagers will be offered up to the final Breeders Crown race, which is Race 14. There will be a guaranteed pool for each Pick 4 of $25,000 and all will have a takeout rate of 15 per cent. In addition, there will be an Early Daily Double for Races 1 and 2, which will be $75,000 Pocono Invitational races, and a Late Daily Double for the last two races on the card. The Pick 3 will be offered for Races 1, 2, and 3, and the takeout will be 15 per cent. Post time for the 2013 Breeders Crown is 5 p.m. Extraordinary Extras Indulge in many standardbred topics at my Hoof Beats blog titled Vast Performances. Thirteen Breeders Crown events kept our staff busy every minute of the program at Pocono on Oct. 12. This card’s recap is not in the order of the races’ presented.